Lightning struck 978 times in the Bay Area Thursday night during a dry storm that prompted a Red Flag Warning for fire danger, according to the National Weather Service. Forecaster Steve Anderson said the strikes occurred between 8 p.m. and midnight from Monterey County up through the East Bay. Friday there is no more threat of lightning, he said. The lightning has since moved into the Sierras and Nevada, he said. But Cal Fire officials said lightning sparks could smolder for hours or days before a wildfire starts, so the threat of fire continues Friday. Cal Fire officials couldn't immediately confirm whether the lightning last night started any fires. 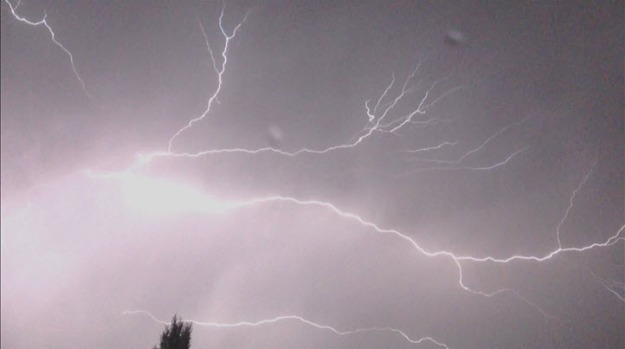 Thunderstorms with lightning strikes rolled through the Bay Area late Thursday. Because of the fire warnings, recreation activities at the Peninsula Watershed closed at noon Thursday, but was slated to reopen at 11 a.m. Friday morning, San Francisco Public Utilities officials said. The Peninsula Watershed comprises the space around San Andreas Lake, the Crystal Springs Reservoir and Pilarcitos Lake. The watershed provides water to 2.6 million SFPUC customers in the Bay Area. The city of Fairfield closed four open space areas Thursday and they remain closed Friday because of the potential for lightning and resulting fires, Fairfield park ranger Teri Luchini said. The spaces will be closed until officials with the Cordelia Fire District, who serve Fairfield, tell city officials it's safe to reopen them, she said. Fairfield officials have closed Rockville Hills Regional Park, Spyglass Open Space, Serpas Ranch and Rolling Hills Open Space. Rockville Hills Regional Park has components of chaparral, which is some of what the Rocky Fire is burning in Lake County, Luchini said. Cal Fire officials confirmed that the Rocky Fire is burning chaparral as well as oak and grass. Cordelia Fire District Chief Keith Martin is "trying to be proactive to prevent another wildland fire," Luchini said.